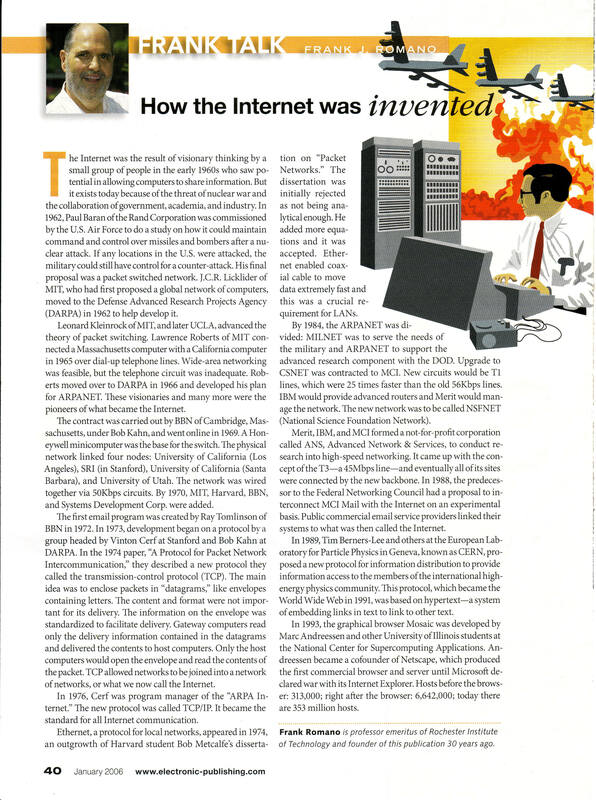 July 10, 2013 By John P.
Back in January 2006 an article was published in Electronic Publishing magazine, which has since gone away, that dealt with the origins of the Internet. It was written by the founder of that publication and Professor Emeritus of Rochester Institute of Technology, Frank Romano, and I’ve attached a scan of the original document here. The information is too valuable to lose, so for ease of reading and searchability I’ve also transcribed the document here. The Internet was the result of visionary thinking by a small group of people in the early 1960s who saw potential in allowing computers to share information. But it exists today because of the threat of nuclear war and the collaboration of government, academia, and industry. In 1962, Paul Baran of the Rand Corporation was commissioned by the U.S. Air Force to do a study on how it could maintain command and control over missiles and bombers after a nuclear attack. If any locations in the U.S. were attacked, the military could still have control for a counter-attack. His final proposal was a packet switched network. J.C.R. Licklider of MIT, who had first proposed a global network of computers, moved to the Defense Advanced Research Projects Agency (DARPA) in 1962 to help develop it. Leonard Kleinrock of MIT, and later UCLA, advanced the theory of packet switching. Lawrence Roberts of MIT connected a Massachusetts computer with a California computer in 1965 over dial-up telephone lines. Wide-area networking was feasible, but the telephone circuit was inadequate. Roberts moved over to DARPA in 1966 and developed his plan for ARPANET. These visionaries and many more were the pioneers of what became the Internet. The contract was carried out by BBN of Cambridge, Massachusetts, under Bob Kahn, and went online in 1969. A Honeywell minicomputer was the base for the switch. The physical network linked four nodes: University of California (Los Angeles), SRI (in Stanford), University of California (Santa Barbara), and University of Utah. The network was wired together via 50Kbps circuits. By 1970, MIT, Harvard, BBN, and Systems Development Corp. were added. The first email program was created by Ray Tomlinson of BBN in 1972. In 1973, development began on a protocol by a group headed by Vinton Cerf at Stanford and Bob Kahn at DARPA. In the 1974 paper, “A Protocol for Packet Network Intercommunication,” they described a new protocol they called the transmission-control protocol (TCP). The main idea was to enclose packets in “datagrams,” like envelopes containing letters. The content and format were not important for its delivery. The information on the envelope was standardized to facilitate delivery. Gateway computers read only the delivery information contained in the datagrams and delivered the contents to host computers. Only the host computers would open the envelope and read the contents of the packet. TCP allowed networks to be joined into a network of networks, or what we now call the Internet. In 1976, Cerf was program manager of the “ARPA Internet.” The new protocol was called TCP/IP. It became the standard for all Internet communication. Ethernet, a protocol for local networks, appeared in 1974, an outgrowth of Harvard student Bob Metcalfe’s dissertation on “Packet Networks.” The dissertation was initially rejected as not being analytical enough. He added more equations and it was accepted. Ethernet enabled coaxial cable to move data extremely fast and this was a crucial requirement for LANs. By 1984, the ARPANET was divided: MILNET was to serve the needs of the military and ARPANET to support the advanced research component with the DOD. Upgrade to CSNET was contracted to MCI. New circuits would be T1 lines, which were 25 times faster than the old 56Kbps lines. IBM would provide advanced routers and Merit would manage the network. The new network was to be called NSFNET (National Science Foundation Network). Merit, IBM, and MCI formed a not-for-profit corporation called ANS, Advanced Network & Services, to conduct research into high-speed networking. It came up with the concept of the T3–a 45Mbps line–and eventually all of its sites were connected by the new backbone. In 1988, the predecessor to the Federal Networking Council had a proposal to interconnect MCI Mail with the Internet on an experimental basis. Public commercial email service providers linked their systems to what was then called the Internet. In 1989, Tim Berners-Lee and others at the European Laboratory for Particle Physics in Geneva, known as CERN, proposed a new protocol for information distribution to provide information access to the members of the international high-energy physics community. This protocol, which became the World Wide Web in 1991, was based on hypertext–a system of embedding links in text to link to other text. In 1993, the graphical browser Mosaic was developed by Marc Andreessen and other University of Illinois students at the National Center for Supercomputing Applications. Andreessen became a cofounder of Netscape, which produced the first commercial browser and server until Microsoft declared war with its Internet Explorer. Hosts before the browser: 313,000; right after the browser: 6,642,000; today there are 353 million hosts. Frank Romano is professor emeritus of Rochester Institute of Technology and founder of this publication 30 years ago. Wow, so basically all this war has benefits too.